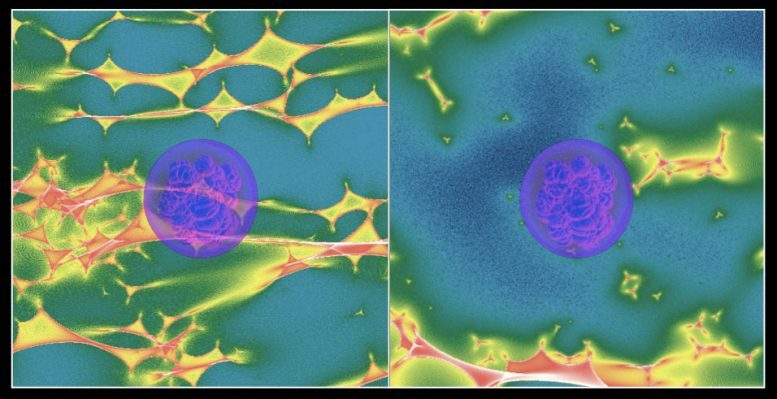 Astrophysicists at Lawrence Berkeley National Laboratory (Berkeley Lab) and the Institute of Cosmology and Gravitation at the University of Portsmouth in the UK believe that strongly lensed Type Ia supernovae are the key to answering this question. And in a new Astrophysical Journal paper, they describe how to control “microlensing,” a physical effect that many scientists believed would be a major source of uncertainty facing these new cosmic probes. They also show how to identify and study these rare events in real time. But last year an international team of researchers found an even more reliable distance marker – the first-ever strongly lensed Type Ia supernova. These events occur when the gravitational field of a massive object – like a galaxy – bends and refocuses passing light from a Type Ia event behind it. This “gravitational lensing” causes the supernova’s light to appear brighter and sometimes in multiple locations, if the light rays travel different paths around the massive object. “Strongly lensed supernovae are much rarer than conventional supernovae – they’re one in 50,000. Although this measurement was first proposed in the 1960’s, it has never been made because only two strongly lensed supernovae have been discovered to date, neither of which were amenable to time delay measurements,” says Danny Goldstein, a UC Berkeley graduate student and lead author on the new Astrophysical Journal paper. After running a number of computationally intensive simulations of supernova light at the National Energy Research Scientific Computing Center (NERSC), a Department of Energy Office of Science User Facility located at Berkeley Lab, Goldstein and Nugent suspect that they’ll be able to find about 1,000 of these strongly lensed Type Ia supernovae in data collected by the upcoming Large Synoptic Survey Telescope (LSST) – about 20 times more than previous expectations. These results are the basis of their new paper in the Astrophysical Journal. “In the early 2000s DOE funded two SciDAC projects to study supernova explosions, we basically took the output of those models and passed them through a lensing system to prove that the effects are achromatic,” says Nugent. For more than a decade, Nugent’s Real-Time Transient Detection pipeline running at NERSC has been using machine learning algorithms to scour observations collected by the Palomar Transient Factor (PTF) and then the Intermediate Palomar Transient Factory (iPTF) – searching every night for “transient” objects that change in brightness or position by comparing the new observations with all of the data collected from previous nights. Within minutes after an interesting event is discovered, machines at NERSC then trigger telescopes around the globe to collect follow-up observations. In fact, it was this pipeline that revealed the first-ever strongly lensed Type Ia supernova earlier this year. Be the first to comment on "Astronomers Believe Type Ia Supernovae Can Explain Why the Universe is Expanding Faster Than Predicted"